Fine tableware, with the proper care, can create memories and traditions that last a lifetime. On the pages below, we’ve gathered care tips and recommendations that we hope will enable your beautiful patterns to safely shine for years to come. Remember, the best way to enjoy your fine china is to use it regularly! Antique china, given the proper care, can last for decades. Older china should always be hand washed. Enemies of older china include scratching, heat, and harsh detergents. Prongs in the racks of many dishwashers may scratch the surface of china, and heat from the drying cycle can loosen trim, eventually causing it to wear away. Dishwasher detergents are sometimes harsh, and are not recommended for washing antique china. Line the bottom of your sink with a dish towel or rubber mat (this will provide protection). Fill the sink with tepid to warm water. Add a mild detergent (no lemon scented detergents or products containing bleach! They contain acid that is harmful to china surfaces and finishes). Wash one dish at a time, and swing the spout away from the wash area (to prevent chipping or scratching). Do not use abrasive pads or steel wool to remove debris. Remember that china is made to use. Long-term storage in areas where temperature and humidity is not controlled can have adverse effects on the glaze of china pieces causing the glaze to become brittle and possibly crack. If you do not use your dinnerware for extended periods (a year or more) take it out of storage at least once per year and wash the pieces. This yearly maintenance will keep impurities from impregnating the glaze, and will help keep the glaze strong. Replacements always recommends hand washing – it is the safest way to care for your china. However, we recognize that for some, hand washing is not always practical. While we do not recommend it, if you must use a dishwasher, china that has been produced during the past twenty years generally holds up better in a dishwasher than patterns that are older – provided the dishwasher is set on a GENTLE cycle. Secure china in the dishwasher, but provide adequate space so pieces do not touch. This will prevent damage from pieces rubbing against each other during the washing process, and will allow for better cleaning as water can reach all areas. Use a mild detergent – avoid lemon scented products (they contain acids, which wear the finish). Let the china cool to room temperature before removing (the trim will have been heated, and is more fragile during this part of the automatic dishwasher process). Heat – China, both casual and formal, should be kept away from exposure to extreme heat, including open flames or naked stove-top burners, unless otherwise marked. Trim – Tableware with metallic trims should never be used in the microwave. To remove tarnish from platinum trim, use silver cleaner, and then wash the item before using. Be careful not rub too hard as the trim can be rubbed off. When stacking china for storage, place a cushioned layer between each piece for protection. 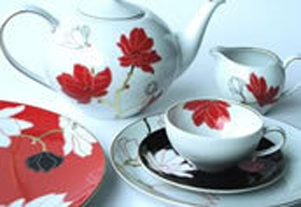 Purchase china cushions or place a piece of flannel, a coffee filter, or a napkin between the pieces. Be careful not to slide pieces on top of one another, for obvious reasons! Stack cups no more than two high, or hang separately on a rack. Stacking cups can weaken the rim, and cause cracking or chipping. Avoid stacking pieces that have handles if possible. Next ArticleWhat’s the Ideal Temperature for your Refrigerator?